In Northeast Asia, stretching for 5,000 kilometres from Mongolia eastward to Russia’s Pacific coast and from Siberia southward to China and North Korea, lies the sprawling basin of the Amur River. The Amur or Heilongjiang, as it is called in China, is one of the planet’s ten mightiest rivers, yet it is hardly known to westerners. For two thousand kilometres, it forms the border between Russia and China – one of the reasons why much of this region used to be a secret, a forbidden zone. Connecting a great variety of landscapes and climates, the Amur’s network of countless rivers includes the planet’s vastest expanses of wild grassland, mountain tundra, boreal forest, volcanic moonscapes, floodplains and wetlands, subtropical forests, the pristine coast of the North Pacific as well as some of Asia’s most productive farmland. This three-part series is an epic journey of discovery of the natural world along the Amur and its tributaries and of the rich wildlife and the native people inhabiting the Earth’s greatest remaining wilderness area – a surprising and exotic world shaped and perpetually reshaped by extreme forces of the atmosphere and one of the Earth’s most active tectonic zones. The three episodes portray the unique characters of the Amur’s lower, middle and upper reaches – separate worlds that could not be more different and diverse. The Amur’s coastal delta is one of the richest ecosystems on earth. Nourished by the mighty river’s enormous sediment load, the Sea of Okhotsk is a marine hotspot of biodiversity with arctic and subtropical species living side by side. Likewise, the land of Russia’s Far East is a unique meeting place of northern and southern plants and animals, boasting the planet’s most diverse woodlands. These wildwoods are still inhabited by Amur tigers, Asian black bears, brown bears, Siberian and Sika deer, sables and otters and countless species of wetland birds. And they are home to traditional forest and river cultures like the Udeghe and Nanai. The Pacific rim is both the end and the beginning of the Amur River system: It’s the massive monsoon clouds the Pacific sends inland which keep the thousand tributaries of the Amur flowing. The middle course of the Amur which is called Heilong-jian or Black Dragon River in China, runs through ancient Manchuria and forms a natural border between China and Russia. Until recently, this was a restricted military zone – restricted for humans but a blessing to wildwoods, wetlands and wildlife. The border between the super-powers is also the reason why the river’s flow remains uninterrupted by dams – an exceptional situation on this planet. 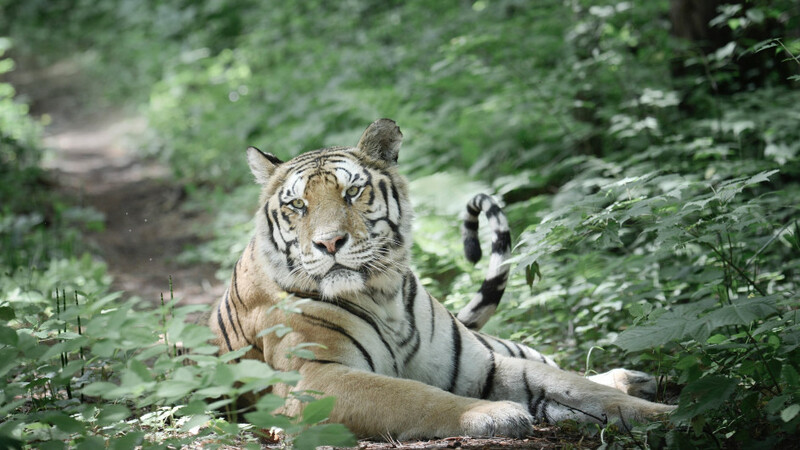 Primeval forests and sprawling wetlands offer habitats to rare species like the Manchurian crane and several of its relatives, white-tailed eagles, soft-shelled Chinese turtles, giant sturgeon and Siberian taimen, Amur leopards and tigers. The Amur’s wetlands are among the world’s major habitats of migrant birds, with hundreds of thousands of white-breasted geese, bean and swan geese and a hundred other species resting and nesting in inland deltas that rival Florida’s Everglades and the Amazon. The border also marks the sharp contrast between Russia’s raw wilderness and China’s farmland with the continent’s biggest and northernmost rice fields. Episode 2 shows how China is beginning to restore wild wetlands and woodlands in order to enable the return of wildlife. On the Chinese-Korean border, pristine subtropical jungle surrounds Northeast Asia’s mightiest volcano. From its crater, a natural shrine for consecutive cultures, flows the Amur’s biggest tributary, the Songhua or White Dragon River. Moving upstream into Mongolia, the itinerary of the series leaves behind the boreal woodland wilderness of China’s extreme North and Siberia’s South to follow the Amur’s two westernmost tributaries across the planet’s vastest wild grasslands. These twin rivers are the Amur’s headwaters. Although they spring from the same mountain – the birthplace and burial ground of Genghis Khan – and then join to form the Amur River, they are an unequal pair, reacting differently to long-term climatic cycles – the rhythmic expansion and contraction of the Gobi desert. Episode 3 follows the massive herds of Mongolian gazelles on their seasonal migrations and the trails of nomadic herdsmen through wilderness regions that are home to steppe eagles, wolves, black vultures, Asian marmots and black-billed capercaillies. This episode shows how the rhythm of all life inhabiting one of the planet’s greatest networks of waterways, lakes and wetlands is driven by climatic cycles. It shows the timeless flow of a mighty river in the sky flowing thousands of kilometres from the Pacific to the harsh, cold desert heart of the continent and of a thousand rivers uniting into a single giant one which drains this immense volume of water back to its true source, the ocean. Directors Franz Hafner and Klaus Feichtenberger have produced numerous prize-winning international natural history films. Together, they have spent many years along the Amur, in Russia, Mongolia and China. Their project has been supported by all the relevant conservation areas and research institutions, allowing first-time and exclusive access to the planet’s greatest remaining wilderness areas. The wildlife, landscapes and the people of the Amur River are portrayed in HD by hand-picked wildlife camera crews. Digitally processed satellite images, time-lapse photography, unique aerial footage and state-of-the-art computer-graphics make the dynamic landscapes come alive. The human perspective of native people of the Amur’s sprawling catchment area portrays the interaction of our own species with wild nature. Until a few years ago, much of the Amur River Basin was hardly accessible to an international public, this being the best protection of its unique ecosystems and wildlife. So far, neither print nor film have done justice to the complete scope of this unique and mighty river. With barriers being gradually lowered, both Russia and China are now considering touristic development of a region, which is rapidly becoming a focus of global interest – politically, economically and in terms of tourism. At the very moment when are doors being opened to one of the last wild realms of the globe, this series offers a first profound and comprehensive portrait of Northeast Asia’s natural world. Read more about the adventures behind the cameras while on the photo-hunt for black-billed capercaillies in our article: ‘Behind the Scenes: Asia’s Amazon and the black-billed capercaillies’. + 1 x 90 min.